Celiac disease affects 1 percent of the American population according to The University of Chicago Medicine. In short, those who suffer from this disease have an immune response triggered when they consume anything that contains gluten. This immune response is an attack on the small intestine's wall and can eventually cause damage to the small intestine. Many of celiac disease's symptoms overlap with other diseases, making it difficult to diagnose. Listed below are 9 often neglected signs of celiac disease. If you or someone you love is manifesting these symptoms, seeing a doctor and being tested is the best way for a proper diagnosis to be had. 1. Joint pain. Often confused with arthritis, the Mayo Clinic points out that joint pain can a sign that something more is going on. 2. Enamel damage. Unless you have had an injury of some sort, your adult teeth should come in with solid, healthy enamel. The Celiac Disease Foundation shares that those who suffer from celiac disease may have defective enamel or discoloration in the permanent teeth. 3. Canker sores. Canker sores can be caused by simply biting yourself or irritating the tender skin of the mouth, but if you suffer from some of these other symptoms, Beyond Celiac includes them in its list of symptoms. 4. Tingling hands and feet. WebMD shares that tingling in the hands and feet can be signs that celiac is at work. 5. Hair loss. Another item on the Celiac Disease Foundation's checklist is having hair loss from your head or body. 6. Anemia. 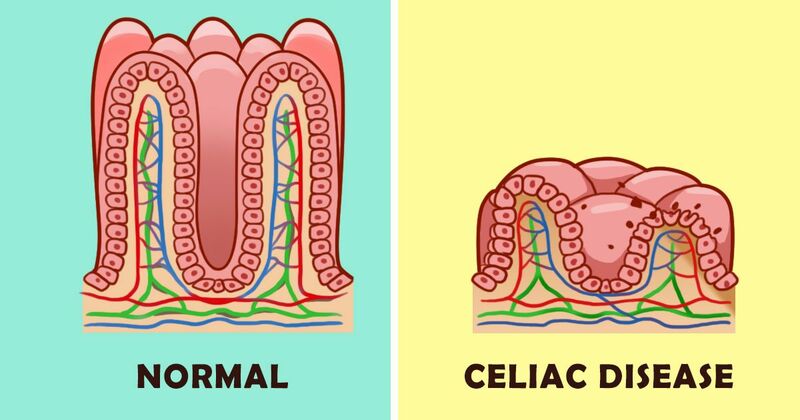 Since celiac disease affects the small intestine, how your food is absorbed is affected. Many who suffer from celiac disease also suffer from anemia according to the Mayo Clinic. 7. Brittle bones. WebMD shares that the bones are "thin" and can easily be broken. Suffering from a higher than normal number of breaks should be a sign that something isn't right. 8. Headaches. Having a headache now and then is normal, but a lot of headaches or even migraines could be caused by celiac disease according to Beyond Celiac. 9. Acid reflux. Since celiac disease is an immune response in your small intestine, acid reflux may also be caused by the disease says the Mayo Clinic. Although none of these symptoms by themselves mean that you have celiac disease, if you have several of them, you should consider making an appointment with your doctor to discuss the possibility. The Mayo Clinic makes a point of telling people not to switch to a gluten-free diet before seeing their doctor as that may negate any tests that are run. Don't remain among the undiagnosed. See your doctor and get the help you need. Please SHARE this helpful information with your friends on Facebook!